By Mark Hand, DC Media Group. Sheriff’s deputies in Alexandria, Va., refused to allow supporters of Chelsea Manning, the government whistleblower who spent seven years in prison, to visit her in jail on Saturday, a day after she was taken into custody for refusing to testify before a federal grand jury purportedly investigating news publisher WikiLeaks and its founder Julian Assange. At the visitor’s entrance to the detention center, the supporters were told they would not be allowed in and that Manning was still being held in a cell by herself in the jail’s intake area and had not been sent into the jail’s general population. On Saturday afternoon, Manning attorney Christopher Leibig told DC Media Group he was on his way into the detention center for his first meeting with Manning since Friday’s ruling. Judge Claude Hilton of the U.S. District Court in Eastern Virginia on Friday found Manning in contempt of court and ordered her to be held in jail until she decides to testify or until the grand jury concludes its work, which could be up to 18 months. 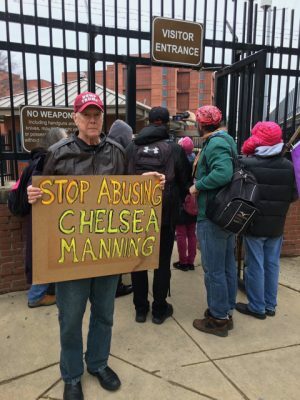 “You have people locked up because they do not want to inform on the press, to compromise the press, so they’re being intimidated by prison, up to 18 months,” Manning supporter and antiwar activist David Barrows said in comments to the press outside the gates of the Alexandria jail. During her seven years in prison, Manning suffered torture, prolonged solitary confinement and a constant struggle to obtain appropriate treatment for gender dysphoria at the Fort Leavenworth military prison in Kansas. On Friday, after the judge’s ruling, Moira Meltzer-Cohen, Manning’s lead attorney, told reporters that “Chelsea has tremendous courage,” although Meltzer-Cohen emphasized her primary concern’s is Manning’s health while she is confined. Manning has vowed not to cooperate with the investigation, saying she has ethical objections to the secrecy of the grand jury system. At her court martial in 2013, Manning provided hours of testimony about her release of the information in 2010. She contends federal prosecutors have all the information they need in this testimony. The investigation that Manning was called to testify in remains secret, but she said she was asked about WikiLeaks. Assange has been charged in the case that remains under seal but was inadvertently exposed by federal prosecutors late last year. “All of the substantive questions pertained to my disclosures of information to the public in 2010 — answers I provided in extensive testimony, during my court-martial in 2013,” her statement said. According to Benjamin, the grand jury shows the Trump administration, similar to the many attacks on whistleblowers during Obama administration, has decided to wage its own battle against a free press. “This is an issue about Julian Assange and WikiLeaks and how the government wants to go after him and to use Chelsea Manning in that way to try to get her to say the same things in 2013 but to say them again in an even more undemocratic process than a court martial because she doesn’t even have public representation in the grand jury process,” Benjamin said. Meltzer-Cohen said it is likely Manning’s legal team will appeal Judge Claude Hilton’s ruling. “This is an appealable order,” she noted.